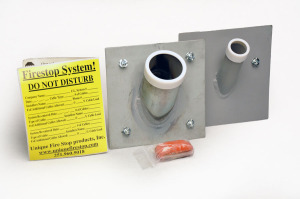 UNIQUE Smooth Firestop Sleeve System is the original and the best quality firestop sleeve for new horizontal installations. Designed to firestop cables and wires through fire- and smoke-rated firewalls. Available in 1″, 2″, and 4″ diameters. This is the original UNIQUE Smooth Firestop Sleeve System. Don’t be fooled by similar looking products of lower quality. Designed to act like a “roller” in the firewall allowing the installer to pull cables through unattended even at a 45 degree angle. A real time saver! 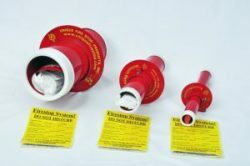 Re-enterable Fire Stop Solution – UL Classified for up to 2 hours horizontally – Multi-Cable Transit System – System UL tested for F, T and L ratings. Manufactured from ASTM Electrical Metallic Tubing (EMT) to UL1479 standards. Powder coated our distinctive RED color. Our most economical product, this System makes firewall penetrations neat, clean, and code-compliant. The wall will be firestopped and smoke sealed 100% of the time. A pair of highly visible documentation/warning labels records cable count, size, installer’s info and the applicable UL Listing # and are used for digital documentation of your installed system. Order today by 10 am for delivery tomorrow. We offer a 24 hour turnaround on special order, shorter or longer lengths. Call us to order at 251-960-5018. Note: These systems are limited to 2 hour rated horizontal installations. 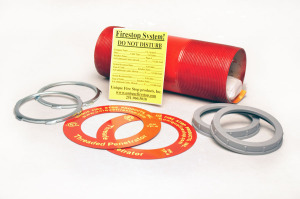 For higher ratings or vertical installations, see our Threaded Firestop Sleeve Systems. Product comes with everything you need, including our UNIQUE Intumescent Putty. 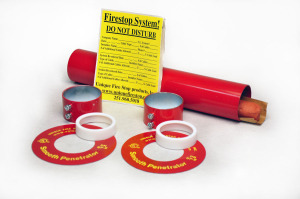 All UNIQUE firestop sleeve systems and endcaps systems include enough UNIQUE firestopping Intumescent Putty for a minimum 25% and maximum of 48% cable load. Order an additional Intumescent Putty Fill Kit here. Take our Free Training and Certification Test to become one of our Certified Installers and receive referrals from the UNIQUE Installers Map plus special discounted pricing on our products. 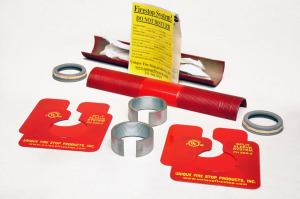 The UNIQUE Smooth Firestop Sleeve System consists of: A 12 inch length of EMT, (2) large washers, (2) sliding compression couplings, (2) plenum rated bushings, a pair of documentation/warning labels and a package of UNIQUE Intumescent Putty. You should use a drill with a level. This will make your Sleeve System install nice and straight! A 6 inch bit extension for your hole bits works very well. Be wary of what might be in the walls. You might use one of the washers to mark your hole. Now drill your perfectly straight hole. On the other side of the wall, install the washer, sliding compression coupling and bushing. While holding the sleeve firmly in the wall, tighten the set screw on the sliding compression coupling. Now you may use the sleeve system as if it were a roller in the firewall, allowing you to pull cables ‘unattended ‘. This is a real time saver! Tear the intumescent putty supplied with the system in half. You will need to apply an inch thickness to each end. If you do not have enough putty, you may purchase an extra Fill Kit. It is an 18 cubic inch stick of UNIQUE Intumescent Putty. 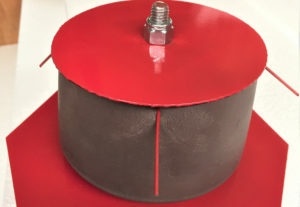 When the cables reach their destination, install an inch thickness of the supplied UNIQUE Intumescent Putty. Alpha numerically ID your installation. Be sure to fill out and apply the labels. Take a picture of your installed System! Determine the System size and penetration point that you want to make in the firewall. See the Cable Load Chart. Up to 48 % of the aggregate cross-sectional area of the Sleeve System may be filled with cables in walls rated up to 2 hours. The remaining void should be filled with UNIQUE Intumescent Putty, supplied with the Sleeve System. Find the applicable UL Listing for your Installation. Look carefully at the illustration ‘Calculating % Fill’. Disassemble the System and remove one end’s bushing by loosening the sliding lock couplings and using the hardware to ‘slide hammer’ the bushing off of one end of the Sleeve. This will prevent damage to the bushing. Be careful when installing the bushing after the Sleeve System is in the wall- it can shatter! If you are installing more than a few Sleeve Systems, for sheet rock, you might consider a cordless drill (with level). Use the proper sized hole saws on 6 inch bit extensions. See the cable load charts for Systems outside diameter (O.D.). Block walls should be core drilled. After the penetration is made, reassemble one side and slide the Smooth Firestop Sleeve through the wall, seating the first washer against the wall. Adjust the sliding set screw lock to equalize the length of protrusion. As long as the hole is the same as the O.D. of the sleeve, no caulk is required behind the washers. Go to the other side of the firewall, slide the washer over the system, and seat it against the wall. Slide the second sliding lock coupling up to the second washer. While pulling on the System, push the second lock coupling against the washer/wall until it seats. Lock down the sliding lock couplings and carefully install the plastic bushing on the end. The Sleeve can now be used to pull your cables through the wall and on to their destination. UNIQUE Intumescent Putty for the sealing of our Systems is packaged with the Sleeve. For the Fill Void or Cavity Material, refer to the applicable UL Listing. If you have questions, call us at 251-960-5018 and ask for Tech Support.